If ‘secularism’ is merely the decline of the role of religion in public spheres or making religion a private matter, it would be difficult to apply the term ‘secular’ to Indonesian history. Ketuhanan Yang Maha Esa, the principle of the ‘divine’ in the Indonesian state ideology Pancasila, has been the basis for religionization and the rejection of references to secularism in Indonesian law, state institutions and other public spheres. At the same time, Indonesia has never aspired to become an Islamic state or adopt a theocratic state model. It adopted the Western notion of the rule of law and a democratic political system. Indonesia thus appears to present a paradoxical situation that conflicts with both the strict concept of an Islamic state and that of secularism. One might also suggest that Indonesia constitutes a unique combination of religion and modernity, reflecting the country’s history. In my research, I intend to explore the diverse perspectives on Indonesian secularity by looking at how the blasphemy law developed and was interpreted over the course of modern Indonesian history. Indonesian secularity was first negotiated as the country moved towards independence in 1945. It has subsequently been renegotiated multiply in light of developments in politics, business, law and culture. The blasphemy law will be used to interpret how various actors in Indonesian history have constructed their concept of state and religion and how these two notions overlap. 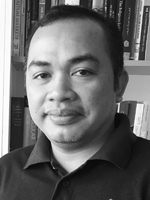 On the basis of extensive reading and analysis, I will outline any evidence of a unique Indonesian secularization, which may support the notion of multiple secularities. Muktiono (2016). “State Ideology of Pancasila under the Particularity of Indonesian Pluralism and World Cosmopolitanism.” In Pancasila as Reality: The Ideas on Pancasila and Contemporer Issues in Indonesia. Edited by the State University of Jember, 20-37. Muktiono (2014). “Seeking Equilibrium on Protection of the Right to Freedom of Religion or Belief in Vulnerable Legal System of Indonesia.” In Human Rights for Religious Freedom in Indonesia. Edited by the Center for Religion and Multiculturalism, Muhammadiyah University of Malang, and the Asia Foundation, 212-23. Muktiono (2014). “The Right to Marriage Among Diverse Religious Adherents under the Indonesian Constitution, Amicus Brief to Constitutional Review of the Act No. 1/1971 on Marriage.” In Becoming Justice Friend: A Guidance for Writing Amicus Brief. The Indonesian Legal Resources Center – HiVOS, Jakarta, 31-62. Muktiono (2012). “Legal Politics on Religious Freedom in Indonesia.” In United in Diversity: Framing Diversity in Indonesia and Germany. Edited by Christoph Enders, and Afifah Kusumadara, 23-33. Leipzig: Leipziger Universitatsverlag. Muktiono et al. (2010). No Middle Road: Public Examination on the Constitutional Court’s Decision on the Review of the Blasphemy Act No.1/1965. The Indonesian Legal Resources Center, Jakarta. Muktiono (2009). “The Promotion of the Right to Democracy for Vulnerable Group in the General Election of Indonesia under the Human Rights Perspective.”Journal of Constitution II/1: 7-31.